When you’re looking for a new set of tweeters for your car so that you can have the best sound system on the block, you have a lot to choose from. Different tweeters have different sizes, build qualities, bass output, and more. 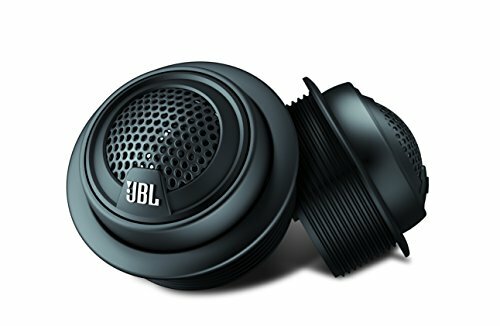 In this article, we’ll walk you through the JBL GTO19T Premium 0.75-Inch Component Tweeter, one of the most popular tweeter speakers on the market today. By the time you’re finished reading, you’ll know exactly what makes this speaker great. The JBL GTO19T is a fairly standard tweeter speaker at first glance. The speaker comes in a set of two and has an understated aesthetic. There’s a lot more to the JBL GTO19T than meets the eye, however. The speaker’s dynamic range is known far and wide for being totally beyond its size and price. You won’t need to worry about capturing the high notes as effectively as belting out the bass. This speaker has both. With a standard fixed mounting and heat-dissipating coil, the JBL GTO19T is unlikely to warp with time, high energy, high volume, custom modifications, or practically anything else. These speakers will live for as long as you have the car – and maybe even longer. The tweeter’s mounting has two components: the speaker itself, and the housing. In some speakers, you can separate these two components to mix and match. This would allow you to place the speaker into areas where there is not a native port on the car or potentially to make a new speaker bank altogether. The JBL GTO19T is inseparable, however. The speaker and the housing are fused together, which is both a blessing and a drawback. If you are looking for a super customizable tweeter that you can rip apart and fit into a new sound system that is not manufacturer spec, you should probably look elsewhere. But if you’re looking for a solid tweeter to join the ensemble within your car’s standard layout, the JBL GTO19T works great. Unlike other tweeters, the JBL GTO19T is machined to high precision to prevent any reverberation during high levels of bass and volume. This means that it is at a fixed angle. Audiophiles will probably prefer a gimbal or eyeball mounted tweeter for superior directional sound quality, but most users will prefer the lack of reverberation under normal conditions to the ability to produce discrete directional sound. To be clear, these tweeters are still at home in a surround-sound system in your car, but the speaker itself can’t accommodate custom super-calibrated directional sound rigs. The value of this feature is that under normal conditions, it provides a superior quality of sound without costing an exorbitant amount. Aside from the orientation of its mounting, the ring around the tweeter itself makes for easy placement into any speaker port designed for a tweeter within your car. Connecting the wires is very intuitive, and even unskilled users will have no problem setting it up. Getting the speaker edge to remain flush with the side of the car is a tad more challenging, but luckily the JBL GTO19T is tolerant of minor errors. The reverberation will not increase significantly if the speaker is not perfectly mounted. The sound quality of the JBL GTO19T is arguably its most important property, and it’s hard to beat at its price point. Most users will be pleased with this profile of audio quality. For pop music and most common musical genres, the JBL GTO19T will do the song justice. For spoken word, the power of the speaker shows itself to be slightly uneven. Higher voiced people will be slightly tinnier, whereas normal voices will be somewhat duller. These differences are noticeable, but not irritating. The stereotypical “radio voice” people sound fantastic owing to the tweeter’s powerful midrange and bass, however. In terms of the music that is best expressed through this speaker, it’s rap music. The beat and heavy bass will be great companions to the speaker’s low reverberation. In contrast, jazz music – notoriously difficult to capture with normal sound equipment – comes through fairly well, but still stands out as a weak point in the speaker’s repertoire. Electronic music tends to carry through the speaker excellently, although vocal tones may be muted. The JBL GTO19T is an excellent all-around speaker that is very hard to beat for its price point. For most users, these speakers will provide a great sound experience that captures the power of the music that is playing without compromising on sound quality. For those who would like to modify their sound setup somewhat, the JBL GTO19T is probably a bit too on-the-rails for your taste. The speaker opts for the “it just works” factor rather than customizability. Installation in custom setups will be harder than it needs to be. Likewise, if you’re an audiophile, you will probably want to pick a speaker that has a bit more vocal tone capture ability and sound quality that is more evenly distributed throughout the spectrum. Those with sensitive ears will be easily able to pick up on the overpowered low peak, mid peak, and high peak of the speakers. These overpowered peaks, while of good quality, overshadow the midranges between the peaks in a way that can be frustrating for music that occurs mostly within those ranges. Nonetheless, practically anyone can enjoy a new pair of JBL GTO19T speakers in their vehicle. Thanks to their ease of use and ability to provide a good sound experience with most music for most people, tweeters are at home in any car.